The presence of Green Fillers in this bouquet will depend on their regional and seasonal availability. The colored packing paper and ribbon can be used to pack gifts items. The roses have been a popular and ultimate symbol of love since old days. Flowers N chocolates are the heart of any celebration!! For your convenience, we have designed this combo of flowers bouquet with fillers and wrapped beautifully in paper packing and chocolates that will undoubtedly be loved by anyone and everyone. Spread the joy of togetherness by ordering this gift combo now. 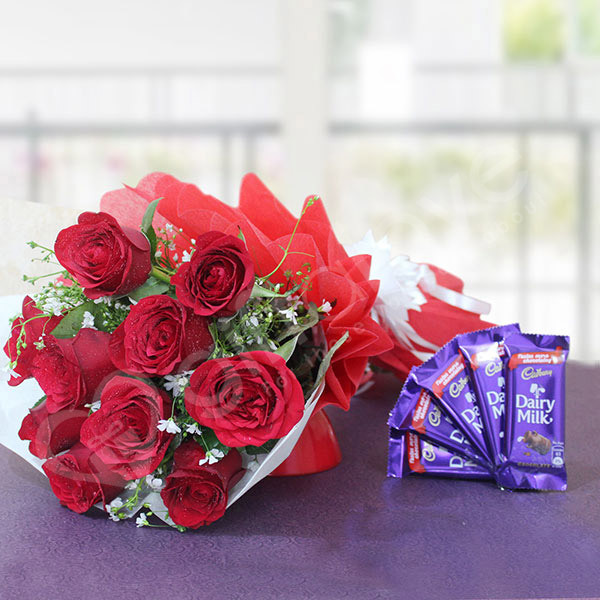 This combo of chocolates and roses is very ideal for the rose day and chocolate day. Ordered this by next day delivery and it did reach on time.